Dragon Door: How did you get started with CK-FMS? Gray Cook:In undergraduate school, I had a major and two minors—studying sports medicine as my degree along with exercise physiology, athletic training, and psychology. I always had the intention of becoming a physician or physical therapist. But the more I studied, physical therapy seemed to be a lot more in line with what I wanted to do. I wasn’t really interested in the chemical/pharmaceutical approach, I wanted to learn how to help the body heal itself. The School of Physical Therapy at the University of Miami is an unbelievably prestigious and difficult program. When I was there, it was harder to get into the PT School than the Medical School, only 16 percent of qualified applicants were accepted! Dragon Door: Sounds like an incredibly competitive environment! Gray Cook: Hopefully this won’t offend anybody, but I had a dilemma with physical therapy. I saw people talking about exercise that weren’t fit, and people who didn’t seem to have good evaluation skills. They just wanted to use heat, ultrasound, electric stim, but didn’t have the capacity to heal with their hands or evaluate with their eyes or hands. While I went to PT school, I loved what we were doing but always had some reservations in the back of my head about becoming a physical therapist. Having been an athlete through high school, I really enjoyed strength and conditioning. At University of Miami, I worked alongside the strength coaches and continued weightlifting. When I graduated in December of 1990, I’d already become a strength coach, having sat for the CSCS exam that November. After graduation, internships and residency, I took many jobs that paid less but had me working with industry gurus. I became an Olympic weight lifting coach just so I could understand the elite spine as opposed to the average spine. Olympic lifters typically put two times their body weight over their head, so they have very different spines than an average person, but I wanted to understand both. Gray Cook: I realized early on that even though I wanted to be at least partially a sports physical therapist, most sports physical therapists knew knees and shoulders but didn’t understand backs. I immersed myself in manual therapy, back therapy—and an underlying theme emerged. Lo and behold, eight years later the core becomes popular subject matter and that’s what I’d been looking at for eight years. I never considered a shoulder, a neck, a hip or an ankle problem without going back to the core and looking at the connection or possible abnormalities. Physical Therapy School positioned me for these ideas, but never connected the dots. We would talk about systems: neurological, muscular, skeletal, and cardiovascular, but never connected them. At school, we didn’t talk about evaluating someone in terms of primary and secondary problems, so we often wound up working on the wrong things. Because of my findings, I was asked to teach courses in functional and therapeutic exercise and while I loved sharing a part of my journey I soon realized everyone had different definitions of “function.” They all wanted functional exercise, corrective exercise, therapeutic exercise, but everybody had a different definition of what those terms meant. I wondered how we could play this game if we don’t have the same rules—the only reason golf is cool is because of established rules. At the time, there were absolutely no rules to functional exercise, and it got a bad reputation. My first conversation with Pavel was actually about dispelling a misconception about functional exercise—he thought we didn’t like lifting. He thought it was all about the bands and things like that. I said no, some people are scared and incompetent about weight lifting so they train other ways. I love weight training, and my definition of functional exercise is exercise that produces better function. This doesn’t mean standing on a BOSU, jerking on a band and balancing a ball on your nose. That’s a circus trick. I can justify how deadlifting might be very functional for one baseball pitcher and dysfunctional for someone who doesn’t have the necessary physical integrity. The only way we can really talk about functional exercise is to have a baseline, so I decided to only teach exercise classes if I could teach screening first. Even though I may think I know how to look at movement and what exercises people need, I’m part of the problem if I’m teaching an exercise course and not teaching an assessment or screening course. That’s the story of the Functional Movement Screen. We owe the people who come to us for help a baseline and more objectivity. Dragon Door: That really makes a lot of sense! How did you get involved with Pavel and the RKC? Gray Cook: Well, believe it or not, Brett Jones and I had history before he became a Master RKC. I had moved back to my hometown to practice physical therapy and to get my family back together in the foothills of Virginia. The town where I live in is literally like the Andy Griffith Show—there’s only one stoplight and no hotel. If someone comes to visit us, we’re going to put them up in the Cook House. I had the local (Chatham) physical therapy clinic as well as a clinic in the neighboring larger city of Danville. Our local clinic has always provided sports coverage at high school and prep school athletic events free of charge, because a lot of the kids in my community are at or below the poverty level. Their parents won’t bring them for medical care if they think they’re going to get stuck with a bill. I had an open door policy and I’ll evaluate any kid and give directions to ice, get an X-ray, etc. just to help. That’s one way I like to give back. The Hargrave Military Academy is literally a half-mile walk from my house, so when I heard that there was a new athletic trainer, I stopped by to introduce myself. This is when I first met Brett Jones, he was taping ankles and had his fanny pack and scissors. We instantly hit it off. He’s got a great sense of humor and we ended up working together for about three or four years. Brett was at the very first Movement Screen workshop ever taught in 1997—at the local clinic! Brett was part of the beginning, but his life took him up to Pennsylvania and then over to California. A few years later, I’m on a flight and going through my mail when I see Brett Jones in the Dragon Door HardStyle magazine. He looked a little bit like the guy I remember but more buff. Sure enough, we caught up with a long conversation. He told me all he had accomplished with kettlebells. Even though Brett had this good screening perspective, he hadn’t seen how far the movement screen had evolved. The screen hasn’t changed, but we’ve really learned how to talk about it at a deeper, more important level. We had also found out what it could and couldn’t do. I brought Brett up to speed on where we were with the movement screen. Brett told me that I needed to check out kettlebells because they were in total alignment with my programs. Brett attended one of our newer movement screen workshops and then he got me to the RKC. That’s when I met Pavel—as a matter of fact, I met Pavel right before my RKC on a visit to LA, and he asked me to screen him. Pavel did great, but I wasn’t surprised, having read his book The Naked Warrior and knowing what he has done. Pavel has never put kettlebell or strength training above his flexibility or movement training, it’s the essence of everything he teaches. A lot of people don’t get that because they just buy Pavel’s books about kettlebell training but not the books (Super Joints, The Naked Warrior, etc.) where Pavel teaches movement, flexibility or how to do a pistol and one arm push up. Pavel’s message is holistic and totally inclusive. The fact that he did wonderfully on the movement screen, and pound for pound is amazingly strong, is a testament to the system. Even though a lot of people misconstrue the system and don’t follow all the advice, it’s not a problem with the system, it’s an interpretation problem. As we talked and developed a friendship, I suggested introducing the movement screen to the RKC system. This way people might participate in more mobility before they try to get strong. 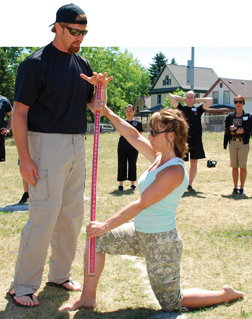 The Functional Movement Screen is a good standard, a tool to reduce opinion and increase communication. It reduces movement into numbers and provides a simple criteria to judge which numbers are deficient and which are acceptable. Now, when someone says that they have the best exercise in the world for a given problem, we can test it. We can check the movement, do the exercise, then check the movement again. It’s not about opinion now, the movement did or didn’t improve from the exercise. We can all improve as coaches and trainers with this type of testing, knowledge, and objective feedback. The Movement Screen also helps us to figure out the source of dysfunctional movement —is it from a structural problem, an injury, or a result of lifestyle, or misinterpretation of fitness? When we can map the problem, it’s easier to track down the source and determine if it’s something we can change. Gray Cook: This was important to me because I know we could have made a more complicated test. But I wanted the FMS to make it to the average high school PE teacher, or the struggling new personal trainer. If we can’t enable the masses with an economical tool, we can’t change anything. I have been using Grays’ screen for quite some time and it works really well. I’M NASM certified and when I first enterd thier system I new something was missing they were suggesting we measure every joint angle,we reaaly weren’t looking as closely at movements. I have a degree in Exercise Physiologyand we had to take sports medicine,so we learned alitttle about compensitory movement,that was what was being left out of NASM the movement. When I went to a Perform Better and was expposed to Grays genius I knew that I found what was missing and as Bruce Lee teaches throw out the useless and adapt the usefull. Have been using it ever since. I have been a practicing Chiropractor for over 17 years. I played college football and loved weight training. In my time in practice and years of experience I sort of came to some of Gray’s conclusions…. much of what we learn as “doctors” or “therapist” does not really stick… LONG TERM. We also CANNOT ANSWER if a person leaves our clinic or facility if the person is “safe” to return to sport with a HIGH DEGREE of certaintity. The FMS allows a doctor, therapist or trainer to SLOW DOWN movement and evaluate neurological misinterpretations or habits that are not E2… effective or effecient. Many a doctor “thinks” he/she “knows” what is “wrong” or “cause” but…. what I have learned in 17 years is this… “I really have no clue what is causing the problem” … but the FMS is a very good guide to begin an evaluation to set a BASELINE… cause MOVEMENT does not lie. It CANNOT be faked or tweeked. It is… what it is. Many “biomarkers” doctors use are only small windows of observations. For example… “blood glucose”. Here is the issue…. I can change someone’s blood glucose number or lab work in about 10 minutes. In that 10 minutes the blood glucose number will change. ONe can do the movement or one cannot. That is one HELL of a baseline that is beyond manipulation from man’s cleverness.